America is in the middle of a love affair with food, as bold and talented chefs from Hawaii to Maine continually reinvent our national cuisine. Here’s your ultimate coast-to-coast culinary bucket list. Four lunch or dinner crowd-pleasers—the messier the better. Dining at Troy MacLarty’s Bollywood Theater is like taking a crash course in Indian street food, and the one dish Portlanders can’t get enough of is the kati roll. MacLarty, a Chez Panisse alum, makes his own paneer (fresh cheese), then steeps it in a yogurt, ginger, garlic, and tikka masala marinade. Next come the toppings: cabbage slaw, cilantro-mint chutney, and a dab of Sweet & Hot. All this gets wrapped in a paratha (flatbread) cooked with egg, slathered in ghee, and fried to perfection. $10. One bite of its well-stuffed oyster po’boy will tell you why this family-run restaurant has been around for almost a century. Domilise’s doesn’t skimp on the Gulf oysters, which come sweet, briny, and freshly fried on a roll from local favorite Leidenheimer Bakery. The sandwiches are dressed with mayo, ketchup, hot sauce, pickles, and shredded lettuce, all in careful proportion—an engineering feat. It’s the quintessential unpretentious New Orleans experience. $15. 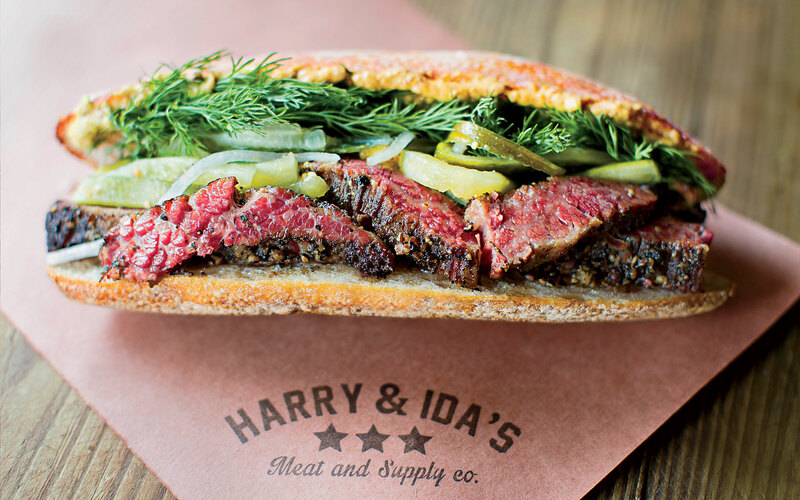 There’s something both comfortingly familiar and wholly unexpected about Will Horowitz’s interpretation of a New York classic, available for take-out at his new East Village delicatessen. Horowitz brines Creekstone beef for two weeks, smokes the meat over oak and maple wood, and then steams it. Instead of using rye bread, he piles half a pound of lusciously marbled slices onto a baguette from top bakery Pain d’Avignon. Old-world mustard blended with white anchovies is the final touch. $18. Traditionally, lobster rolls in Boston are served cold with mayonnaise. And this sleek North End restaurant—which takes no reservations, and nearly always has a wait—does just such a classic roll. But their hot version outsells it four to one. Seven ounces of tail, knuckle, and claw meat are tossed in warm clarified butter, then stacked high on a grilled, buttered brioche bun. Count on a few happy forkfuls before it’s even possible to eat the thing like a sandwich. $29. A dish can be all about looks and theatrics—even better if it tastes great, too. Pork Sausage & Lychee Salad: Rose’s Luxury, Washington, D.C.
At his New American restaurant on Capitol Hill, Aaron Silverman serves a small, family-style dinner menu full of hits. But the star is the pork-sausage-and-lychee salad, which doesn’t contain a piece of lettuce. Instead, a vibrant mix of red onions, peanuts, a scattering of herbs (mint, basil, cilantro), and a coconut-habanero sauce are artfully arranged side by side. The ingredients seem random, but the dish comes together harmoniously: sweet, salty, tart, fresh, and outrageously addictive. $13. Miami’s hottest new hotel, the Faena, wouldn’t be complete without a masterful dish to rival its world-class art. And when the world is already gaga over uni, you end up with Paul Qui’s “unicorn”: sea urchin, grilled corn, lime and calamansi juices, and chile de arbol, all melded in a custard-like filling and finished off with sake aioli, lime zest, epazote, and even more uni. The dish arrives in a black urchin shell set on a bed of dried spices. And there’s another twist: the name is a play on the room’s showstopping unicorn sculpture by Damien Hirst. $25. You have to venture away from busy Waikiki to find Ono Seafood, a tiny hole-in-the-wall storefront in an unassuming complex. But your reward is Oahu’s best poke, a classic Hawaiian dish of fish mixed with soy and sesame. Ono’s recipes are treasured family secrets, created more than two decades ago when founder Judy Sakuma sold her poke out of an Igloo cooler. Today, Sakuma and her daughter still showcase fresh, raw, cubed ahi alongside local ingredients like kukui nuts and limu, a kind of algae. There are no seats in this mom-and-pop shop, so patrons often eat from Styrofoam containers outside. Look for a second Ono outpost opening this summer. 747 Kapahulu Ave., 808-732-4806; poke from $8. Whether you’re counting calories or collecting them, the city has a pair of must-try dishes—both in the West Loop. This haute diner slings between 500 and 700 burgers a day, and the one that’s got everyone talking is the underpromisingly named double cheeseburger. Three—not two—four-ounce patties are griddle-cooked medium, stacked on a bun from the local Z Baking, and layered with a smear of Dijonnaise and slices of Kraft American cheese, which chef Annie Gano loves for its meltability. 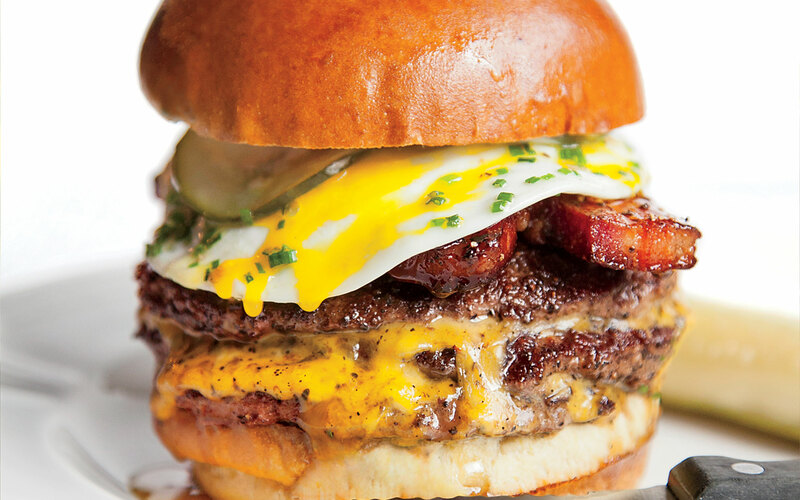 Should you desire an extra dose of culinary hedonism, get an egg on it. $13. This deceptively simple dish, served at Chicago’s restaurant of the moment, includes no steak or egg yolk. The presentation is like fool’s gold: a mound of Japanese tomato cut to resemble minced meat and garnished with Maui onion dressing. The texture is a dead ringer for beef, too, as the tomatoes get dehydrated and then rehydrated, yielding the exact mouthfeel of tender Kobe. How so much flavor—sweetness, acid, umami—is coaxed from those two ingredients remains the chef’s tight-lipped secret. $13. Slices of perfection on both the right and left coasts. 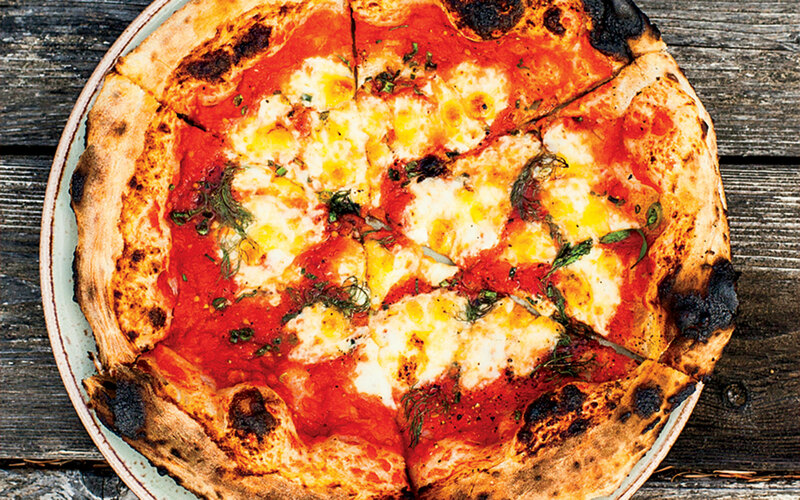 Few destinations have as many excellent pizza spots per square mile as New York City. And yet, Gotham’s latest darling is an inconspicuous restaurant on an unassuming block of Brooklyn’s Clinton Hill. Be prepared to wait—sometimes for hours, even on weeknights—for pizza in as many as two dozen artisanal variations, all courtesy of Matt Hyland. There are daily specials, but we prefer one of the standbys, the Colony, with spicy pickled chiles, pepperoni, and a drizzle of honey, which demonstrates how deft Hyland is at balancing big, bold flavors atop perfectly charred crusts. $18. At his low-key restaurant in the tiny village of Eastsound, chef Jay Blackinton serves both a ninecourse, New American tasting menu—and pizza. Plenty of it. His perfectly blistered pies are made from dough that’s fermented up to 48 hours and topped with ingredients like hay-smoked goat cheese, green garlic, early summer squash, and whatever else has arrived from farms across Orcas Island. If you get the tasting menu, the pizza arrives in a takeout box halfway through the meal—which means you’re set for a late-night snack. Tasting menu $85, pizzas from $12. Ridiculously good birds that everyone’s crowing about. 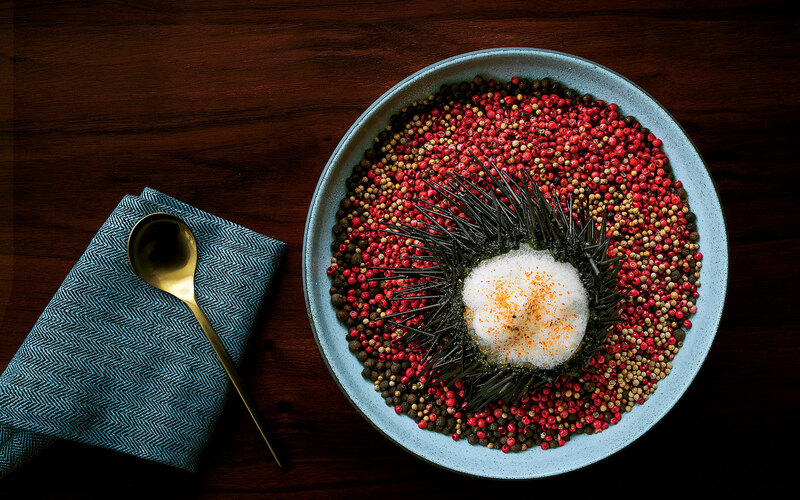 Chef Daniel Humm and restaurateur Will Guidara like to tease those who order this dish at their polished, low-lit restaurant. 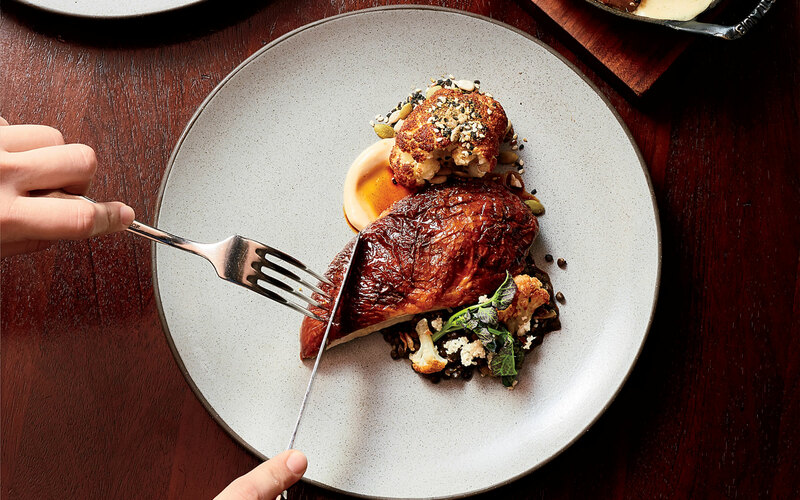 First, a server brings out a cast-iron pot holding a caramel-toned chicken smelling of the foie-gras-and-black-truffle mixture that was piped under the skin. But you get only a quick glimpse before it’s whisked back into the kitchen. After what feels like an eternity (but is just a few minutes), the chicken returns, carved into portions, alongside a truffled potato purée and a tiny bowl of dark leg meat sautéed with shallots and morels. One bite confirms it: this ultimate elevation of a once humble meal deserves a spot in the pantheon of New York’s most decadent dishes. $90. One of the city’s most iconic dishes, unaltered since the late chef-owner Judy Rodgers first served it in 1987, is brilliantly simple. Small, organic birds emerge crisp-skinned and juicy from a wood-burning brick oven and get plated over a salad that’s just as essential as the chicken: grilled, torn rustic bread tossed in a vibrant vinaigrette with sautéed scallions, garlic, baby mustard greens, dried currants, pine nuts, and—crucially—chicken drippings, so those savory juices seep into the bread below. $54. If you don’t know hot chicken, it’s time to get familiar with Nashville’s claim to culinary fame. There are many places in Music City to find these oily, crispy, cayenne-laced (or-laden) birds, but family-owned Hattie B’s stands out for its levels of heat. From noon to night, antsy customers form a line around the block for breasts, thighs, and wings labeled as “hot,” “damn hot,” or “shut the cluck up.” Those who triumph head to communal tables, baskets in hand, where white bread and pickles await to temper the burn. From $9. As far from Super Bowl party fare as you can get. The highlight of Blackberry Farm may be the Barn, the resort’s formal restaurant. 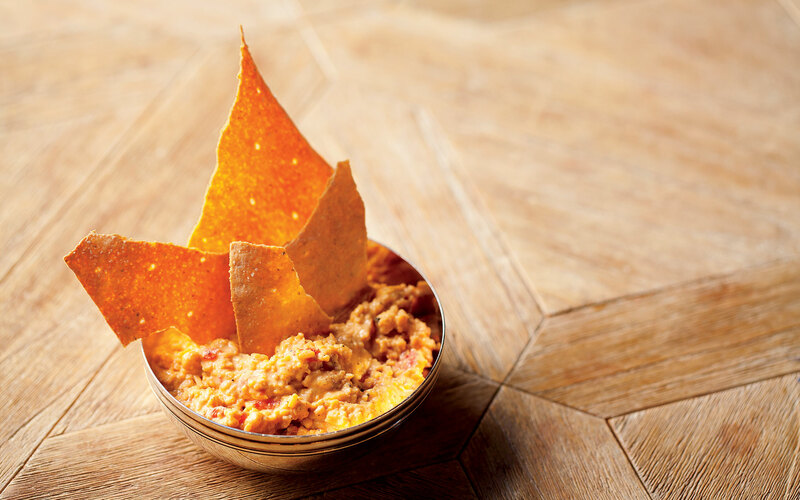 But one could argue that snacking on umami-packed pimento cheese, made with house-roasted red peppers and cheddar that’s aged for four months—all while sitting at a picnic table overlooking the mountains, rosé champagne in hand—is even more memorable. It’s the ultimate combo of kick-yourfeet-up country living and no-holds-barred indulgence. Doubles from $795, including meals. There are two reasons to book the tasting menu at Jessi and Jennifer Singh’s East Village Indian restaurant. One, it guarantees you a reservation (à la carte diners get in on a first-come, firstserved basis). Two, the tasting menu includes the curry sampler—six dip-size versions of flavorful dishes like raw scallop curry and Long Island duck curry. Notes of turmeric, ginger, and garlic shine through instead of the usual coconut milk. Tasting menu $62. How do you perfect a dish as simple as hummus? Michael Solomonov, who put modern Israeli fare on the map in America, has done it at his signature restaurant, Zahav. The hummus was so popular that it inspired his more casual, hummus-focused spinoff, Dizengoff. Solomonov’s secrets include using small chickpeas for even cooking, lots of tahini, and sesame seeds from Ethiopia. The result is an ethereally light, silky dish that’s revelatory on its own, but even better when topped with crunchy chicken skin or roasted Japanese eggplant. From $10. The traditional grand aïoli—a feast of boiled seafood and vegetables with thick garlic mayo for dipping—hails from Provence. But Matthew Dillon’s version, served at his sun-washed restaurant in Pioneer Square, anchors you firmly in the Pacific Northwest. Dungeness crab claws, iridescent trout roe, and fruitwood-smoked mussels share space in the bowl with charred favas, snappy radishes, and slender green beans. Dillon will sometimes even add sumac to his whipped aioli for a balancing hint of acid. From $30. Global flavors stunningly reimagined in American kitchens. Chef Cara Stadler is only 28 but she already has two restaurants and three nods from the James Beard Foundation. At Tao Yuan, she cooks pork rump or shoulder sous vide overnight in her greatgrandmother’s secret sauce. She then packs the meat, along with brown-bean paste, garlic, hoisin sauce, and black pepper, into the center of airy buns made by her pastry chef that day. $7. Odds are, Soviet-era food is not something you crave on a regular basis. 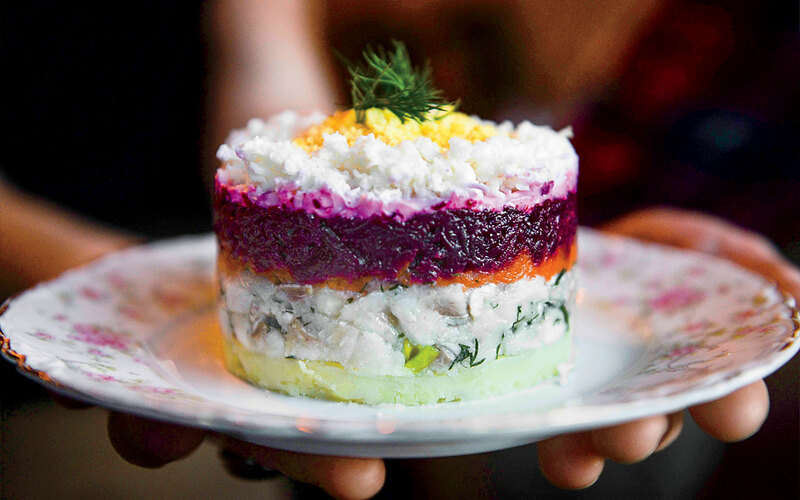 Chef Bonnie Morales will change that with her take on a Russian layered salad. The ingredients may be humble: grated potato, salt-cured herring, a layer each of grated, roasted carrots and beets, then a dollop of beet-infused mayo topped with a finely crumbled hard-boiled egg. But Morales stacks them so artfully that the result is a masterpiece of textures and flavors. $8. The comfort food of the moment reaches a peak with two indulgent new twists. 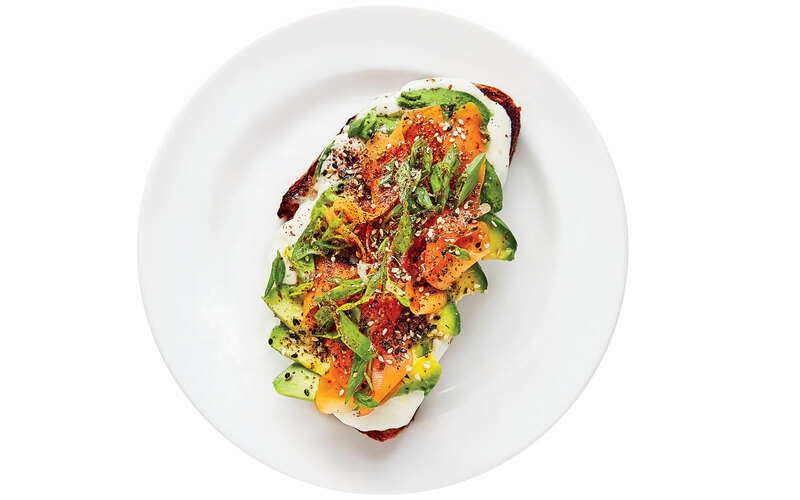 Yes, avocado toast is everywhere. But once you’ve had Jessica Koslow’s version, it will cross your mind weeks later like a longdistance lover, and the next thing you know, you’ve booked a flight to reunite in two days. A thick foundation of warmed country bread supports an uninhibited schmear of garlicky crème fraîche, half a Hass or Reed avocado, hot pickled carrots, strips of green onion, housemade za’atar, a heavy squeeze of lemon, and a sprinkling of fleur de sel, the queen mother of salts. $9. You’re probably familiar with Danish smørrebrød and Swedish smörgås, but the dinner-only, do-ityourself plate of Nordic-influenced toasts at the Bachelor Farmer keeps things fresh. Waiters bring out bread on a silver caddy with a generous selection of seasonal toppings (herring, fruit compote) that often nod to Minnesotans’ Scandinavian roots. You can’t go wrong with any of the flavor pairings, from cow’smilk cheese with oyster mushrooms and bacon-onion jam to beef tartare with fried parsnips. From $15. Nestled in the Vermont forest, this bucolic all-inclusive getaway is home to America’s most perfect pancakes. 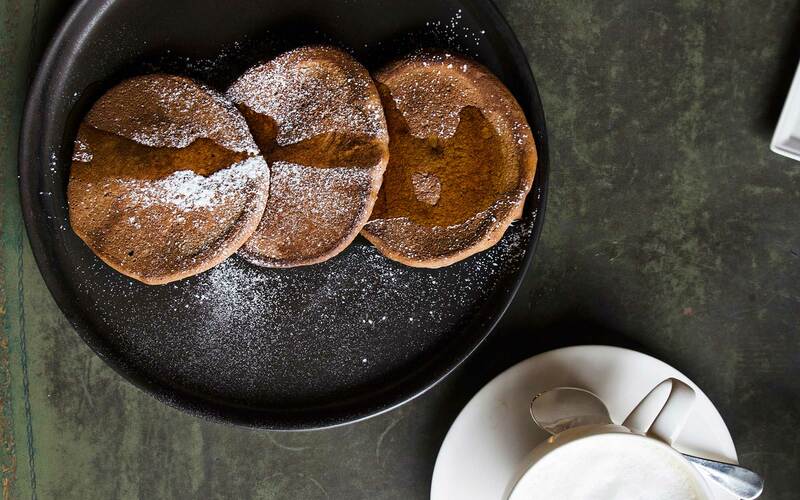 Since 1993, each acting chef (currently, Nathan Rich) has carried on a tradition every morning of flipping light-as-air, soufflé-style pancakes in the Main House. The secret is egg whites whipped into stiff peaks and then folded into the batter. The addition of seasonal, often locally grown fruit results in flavors that change daily—sweet raspberry-almond, citrusy lemon-poppy-seed, creamy banana-chocolate. What remains constant is a breakfast that’s quite possibly better than any dessert and ends only when you’re too full for more. Doubles from $1,500, all-inclusive. The two most delicious cookies in the country are in the South, 500 miles apart. Try swinging both in one trip. Austin dessert darling Laura Sawicki is used to seeing her work on Instagram (look for her birthday-cake ice cream sandwiches). But it’s her take on the Samoa Girl Scout cookie that has everyone clamoring to get in to Launderette, her new East Side restaurant with partner Rene Ortiz. 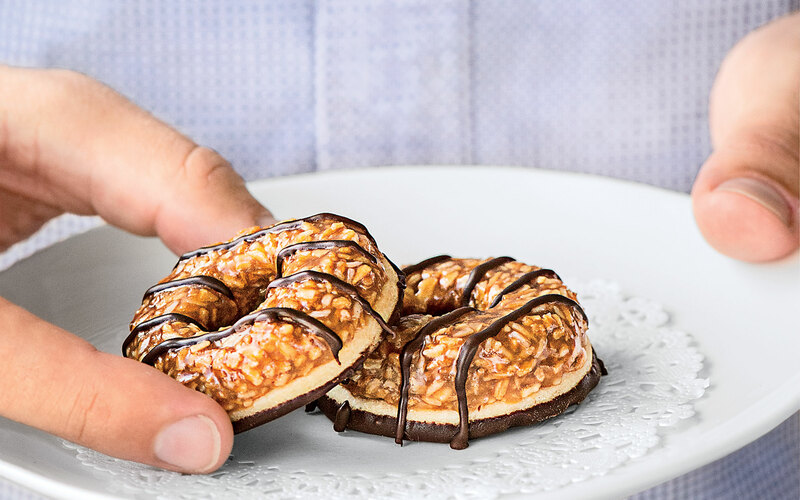 Just like their inspiration, the cookies come topped with crunchy coconut and drizzled lines of chocolate, but Sawicki adds a hint of butterscotch and savory miso for a grown-up twist. $6 for two. Though it’s barely a year old, this light-filled restaurant and bakery is earning raves for its spin on the classic cookies-and-milk combo. Five kinds of Valrhona chocolate go into the cookies, which come topped with a pinch of sea salt to counterbalance the sweetness. But the defining ingredients of the dish come on the side: an actual eggbeater, its spokes cleverly dripping raw chocolate chip-cookie dough, and a cup of Tahitian-vanillabean-infused milk—dunking compulsory. $8. Edited by Jacqueline Gifford and Lindsey Olander. Reported by Julia Bainbridge, Lila Battis, Nikki Ekstein, Adam Erace, Laura Itzkowitz, Carey Jones, Stirling Kelso, Hannah Wallace, and Stephanie Wu.